Welcoming and cheerful, historic and cultured, Thailand exudes warmth, from its shimmering temples to its smiling people. Experience the incredible culture, history and colors of Thailand! With exciting activities like visiting the Bangkok Flower Market, exploring the Life Risking Market (because the stalls are on the working railway), sampling local cuisine on a culinary tour, boating down the Mekong River, spending time with rescued elephants, meeting the people of the Karen Long Neck Village, stepping into Laos and more, this is a culturally immersive adventure that will leave you with memories for a lifetime! Travel with Jewish Young Adults from across America and beyond on this absolutely colorful and amazing 9 day adventure to Thailand that will keep you captivated at every turn. Spending time in Bangkok, Chiang Rai and Chiang Mai will allow you to experience so much of this incredible country. Want to enrich your experience even more? Join our post-trip to Phuket where you will extend your Thai vacation at a beautiful beachfront resort. Click here to see a preview video of Amazing Thailand! This tour is limited to 24 guests, where a smaller group will make your travel experience more personal. Arrive in Thailand’s capital city of Bangkok today. Since most of the international flights from North America will arrive in the evening, the remainder of the day is free for leisure and relaxation. This morning, meet your fellow traveling companions for an Amazing Journeys Welcome and Orientation. Thailand’s capital since the 18th century, Bangkok is a city of gleaming modernity firmly rooted in ancient Buddhist traditions and beliefs. Today we explore Bangkok’s rich heritage as we experience it by taking a long tail boat cruise down the Chao Phraya River. We’ll see the traditional way of living. 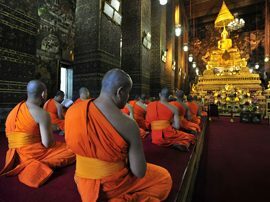 Along the way, stop to visit the Temple of Dawn, officially named Wat Arun, and an extraordinary feat of architecture. It’s one of the most revered sights along the river. Then we visit the exquisite Grand Palace and Emerald Buddha Temple. The famed palace occupies nearly one square mile. Built in 1782 by King Rama I, it was the center of power for more than 150 years. After an authentic Thai lunch at a local restaurant, spend the afternoon visiting the Bangkok Flower Market (Pak Klong Talad), the biggest wholesale and retail fresh flower market in Bangkok. The market has all kinds of popular flowers and flora including roses, orchids, lilies and more. We’ll then head to Wat Pho, the world-renowned reclining Buddha Temple. We’ll meet our guide bright and early this morning and drive to Maeklong Railway Market (Hoop Rom Market), located in Samut Songkhram Province. This market sells seafood, vegetables, fruit, fresh and dried food, meats and other miscellaneous goods. This well-known market is also called the Life-Risking Market because its stalls are attached to the still active Mae Klong­Ban Laem Railway. When the train comes down the track, vendors rush to clear all the goods that will obstruct the incoming train and visitors hop to the side as the train sneaks by. 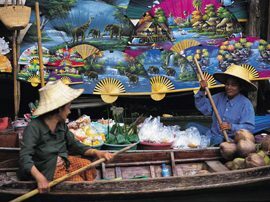 After, we’ll continue with a visit to the site of the world-famous floating market of Thailand. From dawn till mid-morning, a multitude of farmwives paddle in with fruit, vegetables and other products for bartering or selling until the main canal is choked full of sampans carrying every edible plant, some which may be unfamiliar to you. This morning, we’ll head to Farm Ang-­Thong Pier in Nonthaburi to board our boat for a 15-minute ride to Baan Dvara-Prateep on Koh Kred Island. We’ll arrive in Baan Dvara-Prateep where we will be welcomed with true Thai hospitality. Breathe in the deep embrace of nature and take part in a relaxing group Oriental stretching exercise to improve blood circulation and respiration. This will assist balance and self-healing. Explore by bicycle (or on foot), to experience the ambiance, serenity and simple beauty on Koh Kred island. 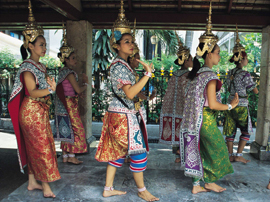 A well-­prepared Thai traditional lunch will be served. In the morning, we’ll visit the Baanchang Elephant Park. Here, you will meet rescued elephants and share in an experience as you care for them. Some of the daily activities with the elephants include giving a daily health check, feeding them, taking the elephant for walk for exercise through jungle (no riding), observing the elephants resting in their natural environment and bathing and scrubbing the elephants. Enjoy lunch as well as a tea and coffee break in the park. We promise, you won’t be able to stop smiling during this experience with healthy and happy elephants. The order of the tour may be change. This tour requires average physical activity. You should be in good health, be able to climb stairs and walk reasonable distances, possibly over uneven grounds and cobblestone streets. After July 11, 2019, prices increase $100. A deposit of $350 is due with your reservation. Full payment is due November 6, 2019. *Pay final payment by check and receive a $100 reduction in price. Items listed on this website are subject to change at any time. By providing payment you agree to the terms and conditions as outlined on this website. Cancellation Policy: From the time of deposit until July 11, 2019, there is a $100 penalty for cancellation. From July 12 – November 6, 2019 the cancellation penalty is the amount of the deposit. From November 7, 2019 – January 6, 2020, the cancellation penalty is 50% of the total package price including the post-tour package to Phuket. From January 7, 2020 until the day of travel, the cancellation penalty is 100% of the total package price including the post-tour package. Cancellations made on the day of departure and “no-shows” will receive no refund. There is no refund in the event of interruption or cancellation after the start of the journey. Flights: One flight segment within Thailand is included in our pricing. One flight segment is included on our post-tour package to Phuket. International flights are not included. It is important that you not purchase airfare until you receive a confirmation letter from Amazing Journeys which will contain specific flight parameters. Transfers: The meeting location for the tour begins and ends at our starting and ending hotels. Transfers from and to the airport are not included. Further details will be provided in the weeks prior to the tour departure. Taxes and Gratuities: All taxes, government fees and gratuities have been included in the cost of the tour package. These include baggage handling (one bag per person), local guides and drivers. Taxes, surcharges and government fees are subject to change. Passport and Visa: A passport is necessary to travel on this itinerary. It must be valid for six months beyond the last day of the trip. There are no visas required at this time for entry into Thailand for US, Canadian and UK citizens. If you are from a country other than those mentioned, please check with the Royal Thai Embassy to find out if a visa is necessary.